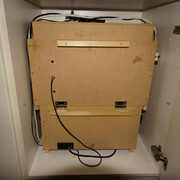 www.sausagemaking.org • View topic - My new DIY wireless curing chamber! 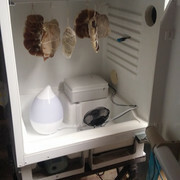 Hi all, I'm a long time lurker on this forum but have only just registered as I wanted to share my new DIY curing chamber with you. 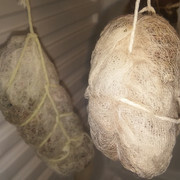 I've been curing/drying small pieces in my kitchen fridge for a while but the temperature/humidity is far from ideal and I was only able to work with small pieces due to lack of space in an already cramped fridge! 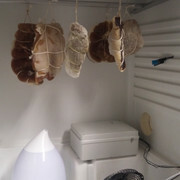 And as I don't a suitable 'natural' location to dry meat I figured the only way to go was to use a dedicated fridge where I could control the environment. Conveniently, a friend at work was looking to get rid of an under-counter fridge after a kitchen refurb so I claimed it, cleaned it up (after it sat outside for 3 weeks) and put it in my garage (which gets hot in summer and freezing in winter!) I then got to work with the electronics/electrical elements. Now I should point out at this stage that I'm a bit of an electronics/electrical/software nerd in my spare time, so there is a bit more to this then I'm stating here, but I thought I'd give you the summary and if there's interest from other members, then I can expand and provide more detail. The benefit of this control method compared to most of the other DIY curing chambers I've seen online is that in this case it cant 'fight' against itself. I control the temperature then let everything settle, then control humidity and let everything settle then provide ventilation and let everything settle. I'm generalising here, but essentially this is the most economic way I can come up with to control a drying environment. Like I said above, I don't have anywhere even remotely close to a natural drying environment so this is my solution! 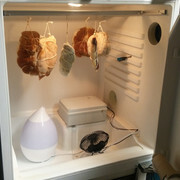 So with a bit of tweaking, what I now have is a fridge in my garage that controls temperature, humidity and at least simulates a fresh air 'breeze'. - The garage was the best place I had to install this but its still not ideal as I use the garage for occasional DIY projects. So I added a switch to the outside of the fridge that when switched on will disable the external air circulation to effectively seal off the environment if I'm sanding or just generally making a mess. 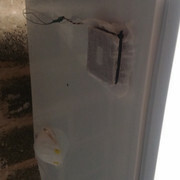 Then once the mess is clean, I flick the switch and ventilation resumes. - I added wireless communications to the controller which allows it to transmit all of the conditions of the fridge to a wireless receiver. 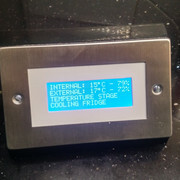 This receiver sits in my kitchen (and looks noticeably better than the fridge itself) and displays temperature/humidity and operational status every 60 seconds. It also has an alarm built in and can notify me of temperatures/humidities out of range, sensor failures, ventilation inhibit switch left on, communications failures etc. 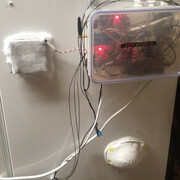 Note: The clip lock food tub was never intended as a wiring enclosure. 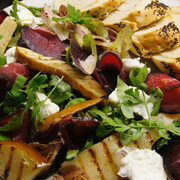 But for a budge working prototype, on this occasion it does the trick!....For now. So although this is all working just fine, I am going to refine it moving forward. I'll add some switches to the remote receiver so I can alter the temperature/humidity set points easily and also tweak the software to improve the control and show more info on the screen (long term averages for example). It's currently just a working prototype after all. Everything else you see in the pics was either scavenged or already in my parts supply, either way, there's nothing expensive there. 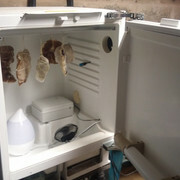 So there it is, I appreciate some may see this as overcomplicated for somewhere to dry meat but considering that I don't have a natural drying environment at my disposal plus the fact that electronics/software is a bit of a hobby for me, I've actually found this a really enjoyable little project and now I can dry larger pieces of meat conveniently under a controlled environment and I have my kitchen fridge back in all it's glory! I'd welcome any questions and if there's demand then I'm sure I can come up with some diagrams if anyone wants to build one themselves. 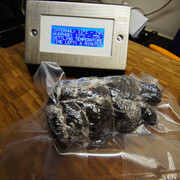 Re: My new DIY wireless curing chamber! Looking good , you may want to consider adding pid control algorithms, they are readily available for Arduino. I think that there may be problems with the BB code for video on the site following a server move. Please bear with it by linking how you have. Many of us are very interestested in what you've done. Many of us have similar chambers ourselves. Thanks Phil, I'd assumed it was a technical issue, so thanks for the clarification. Well I thought I'd post a quick update. It's been about 10 days since I started this post and TBH the following 2-3 days had me a little concerned! 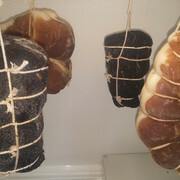 I'd had no appearance of mould whilst curing in the fridge over the past 2-3 months, which I'm assuming is because of the low temperature and low humidity. 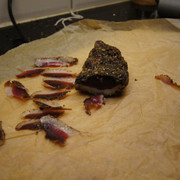 But I also knew that whilst this environment was passable for small pieces (duck breasts, small steaks, small bacon slabs etc), I knew that it would start to compromise the end product as I was moving on to larger pieces (i.e. 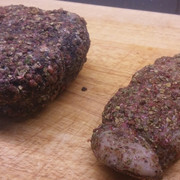 the two pork leg pieces were circa 1kg each when they went in). 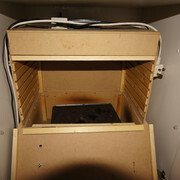 Hence the fabrication of this curing chamber. 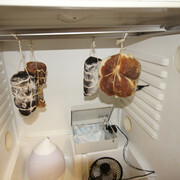 So anyway, after approx 2 days in the new chamber at a set temp of 12C and set centrepoint humidity of 70%, the two pork pieces developed multiple plumes of white, developing to green, mould. It started off looking fine/granular and so I thought it may be penicillium (easy mistake to make as I hadn't seen it before!) However it was soon evident that it wasn't penicillium. My controller was doing a great job in maintaining the set values that I'd given it. And when I say great I mean that the 12 hour rolling average vales were 12C and 68% humidity. But I did notice that on the ventilation cycles where 'fresh' air was being brought in for 5 mins, the temperature was peaking at around 18-19C (obviously depends on the garage temperature at the time). In addition to this, it would seem that the humidity cycle did not have enough time to recover from the artificially low humidity reading that resulted from a cooling cycle and so was adding humidity unnecessarily. 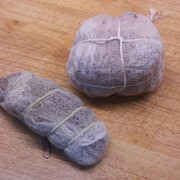 So I used white vinegar to treat the undesirable mould (which by this point was starting to show on the flesh of my 'plain' duck breast and also just slightly on my peppered duck and peppered beef rump, albeit through the muslin). 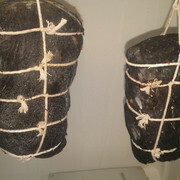 Long story 'kinda' short, I made some changes to the software last Wednesday (14th June) which was also the same day that I added in two pieces of bresaola (approx 800g each) just out of their 5 day wine bath after a 4 day salt cure and I then left the house empty for 5 days to visit relatives! 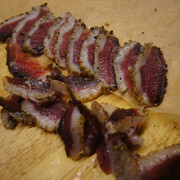 I'm sure there's more to come here as the pork gets closer and the bresaola develops. I'm also hoping to get hold of a whole deer leg from a deer stalking friend of mine, so this may become my first bone in whole joint cure! I've also obtained a 3D printer recently so I might have a go at producing a more aesthetic enclosure for the 'receiver' element of this whole endevour as one of my first printing projects. And everything else is coming along just fine. 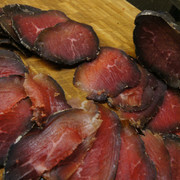 I'm confident enough now the I have penicillium on the bresaola and it's transferring just fine over to the ham. Everything is drying out steadily. There's one or two patches of slightly green mould but I'm not treating them, I haven't felt the need to treat any mould for 2+ weeks now, I'll just let the penicillium maintain some kind of balance. 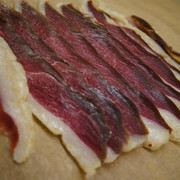 And after 14 days, the smaller piece of bresaola has hit it's target, it started at 415 and is now 260 which is close to a 40% loss. 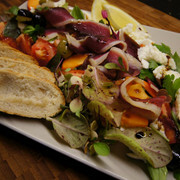 Now as tempted as I was to dive straight in, I'm aware that this has lost a lot of moisture in not a lot of time! 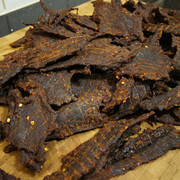 It certainly doesn't exhibit any signs of case hardening, infact it looked/felt/smelt amazing. 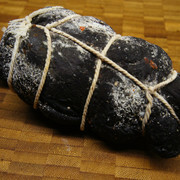 But I resisted and vac packed it, so it's not going to sit in the fridge for a week or two to settle out a little. Then i'm pretty sure it's going to get devoured! 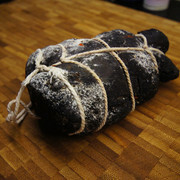 Oh and I almost forgot, I've got 2 whole venison legs on the way in the next month or so. 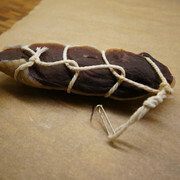 I'm thinking one for a whole venison prosciutto and the other for some sort of venison salami/sausage, can't wait! P.s. As luck would have it, I've also come into possession of a combined fridge freezer so I'm going to transfer all the bits and bobs from this fridge over to the new one. This'll give me a bit more room but more importantly a freezer section which should be at the perfect temp for cheese maturing! 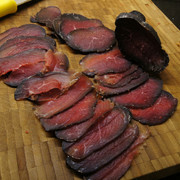 Another option I like would be venison summer sausage which a hot smoked product. I'm really happy with how this turned out and by chance I picked up a single muscle silverside joint today from the supermarket at £6.50 per KG which I'm going to prep as a single piece of bresaola, can't wait! 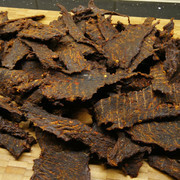 I make Jerky in my DIY dehydrator, I made this about 10 years ago and it's been completely faultless. I'll go into further detail about how it works if there's interest. As a quick side note, I'd hope the fact that a wooden electrical appliance that has been working for 10 years+ in occasional heat and humidity would be enough to assure readers that this method is not a death trap/insane fire risk,,,,if done right.